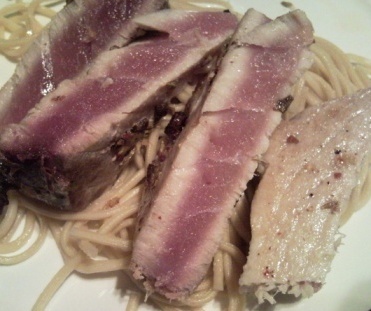 If you have ten minutes to prepare a meal, then this Seared Tuna Served On A Bed Of Noodles recipe is perfect. The key with tuna is to make sure it is super fresh. You can freeze it if you want to or if you have more than you can eat in one meal. To freeze tuna all you need to do is portion it. Then cover in two layers of cling film and put it into your freezer. To defrost I would suggest doing so overnight in the fridge. Excellent recipe. Thank you doll. thank you so much. I put the food quiz up here with a link back to you!